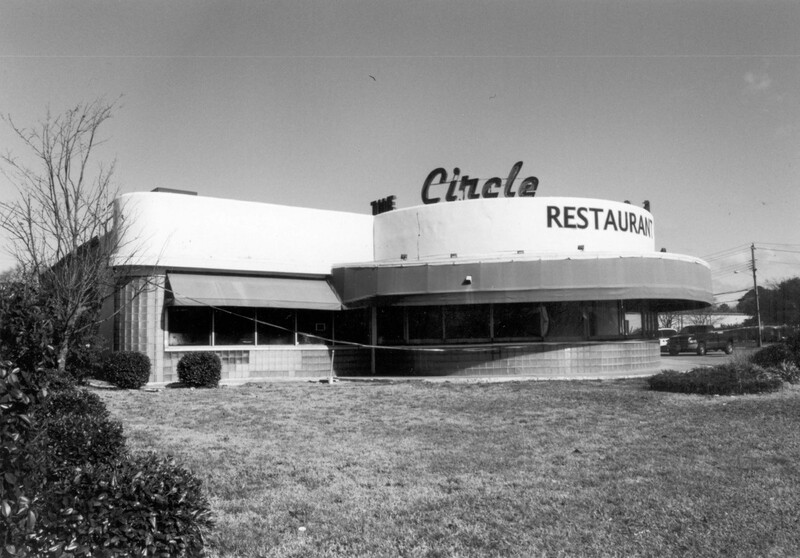 Built as a curb-service restaurant in 1947 in Portsmouth and later expanded, The Circle features a circle-shaped front façade with a neon sign on its roof. Designed in the Moderne style, which emphasizes curved surfaces and horizontal lines, the building’s original circular portion housed a main dining area and bar. A mural behind the bar, in the style of the era’s popular illustrator Al Hirschfeld, shows caricatures of celebrities from the mid-20th century. The Circle, a rare example of Moderne architecture in Portsmouth, reflects the surging popularity and importance of the automobile in American culture in the years immediately following World War II. The restaurant closed in 2008, and the building was demolished in August 2013.